As F1’s only full night race, the Singapore Grand Prix needs light – lots of light. 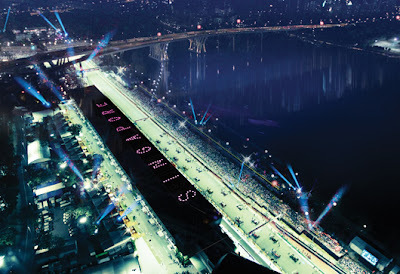 In all, the circuit is approximately about four times brighter than a regularly floodlit sports stadium. Pirelli will offer its yellow-banded Soft and red-banded Super-soft tyre compounds this weekend. This combination was used in the Canadian GP and in Monaco. Drivers will change gears roughly 80 times per lap while navigating Singapore's 23 corners. This translates into tough racing for tires and gearboxes. The track has been resurfaced on the approach to, and at the apex of, Turn 13. The outer pit lane has been resurfaced. All rubber curbs have been replaced by fabricated steel sections anchored securely to the ground with 24mm diameter bolts. One DRS Zone, which remains unchanged from 2011. The detection point is at Turn 4 and the activation point is after Turn 5. As usual, tires will once again be one of the biggest factors going into Sunday’s Grand Prix. One of the longest races of the series in duration due to the slower speeds, heavier gas tanks and weather conditions that are extremely humid and damp, Singapore offers a difficult yet challenging race for all drivers. Additionally, this is a street circuit and there are manhole covers and street paint that make navigating that much more difficult and bumpy, especially when damp. Because the race is held at night, temperatures go down as opposed to the typical Grand Prix raced during the day. Nursing tires through 23 curves on a damp track at night is no easy feat and the declining temperatures will only add to the woes as traction is crucial in making it around each lap. As drivers lose heat in tires and gas from their tanks, so goes their grip lap by lap. Consider Singapore the opposite of Monza, where full throttle was the name of the game. Pirelli has chosen its Yellow Soft and Red Super-soft tires to help add grip to this incredible street circuit. Strategy also plays a major part. My take is it will probably be a two- or three-stop strategy for most. It will be interesting to note who starts on the harder of the two compounds in an effort to go as long as possible before having to make a pit stop or who will use the softer compound to gain greater grip at the beginning to make a dash for the front - far enough in front to keep (and hold) the position while making mandatory tire changes later in the race. It’s anyone's guess at this point which teams will employ which type of strategy. As stated above, Singapore can be quite damp with humidity ranging from 75%-90%. Temperatures are forecast for highs of 89°F during the afternoon to low temperatures of 77°F in the evenings. A 40% chance of thunderstorms are predicted for Saturday’s qualification while Sunday holds an even greater chance of storms at 50%. It’s an interesting quandary as this race has never been run in the rain. Between being run at night, the glare of the lights, the slowness and bumpiness of the circuit, rain might make an already dangerous race that much more exciting. Sebastian Vettel swept both free practice sessions today edging out Lewis Hamilton in the first session, followed by teammate Jenson Button in the second. Tune in to SPEED at 9:00am ET as we monitor the weather and watch qualifying this morning (Saturday) to see who takes pole position. SPEED will broadcast the Grand Prix of Singapore on Sunday, September 23 at 7:30am ET. It's amazing how much more sense the F1 races make now that I've been reading your posts. Like many motorsports fans, I like watching just about anything with an engine race but I never paid as much attention to F1 because I couldn't watch many of the races until the three years or so. Now hearing about the Super-soft Pirellis only lasting 10 laps at the beginning of the race because of the weight of the full load of fuel means something! Thanks, Lisa! Welcome, LJ! Usually its tire management and pit stop strategy that can play a huge role within each race. Much like other Series, it is dependent on how fast/slow and/or close together the turns are, car set-up, and a good driver who knows how to nurse those tires.